For Christopher Longhurst, MD, the decision to leave Stanford University School of Medicine after more than a decade wasn’t an easy one. But the opportunity to leverage the knowledge he gained as CMIO to help lead UC San Diego through a period of unprecedented growth was too good to pass up. In this interview, he talks about how his team is working to support the strategic priorities of the organization while creating as much value as possible in the healthcare delivery process. Dr. Longhurst also talks about the collaboration taking place across the University of California Health System, the team he put together to help carry out the organization’s vision, why population health must be top-of-mind for all CIOs, and how the CMIO role has evolved. We also have a major effort underway with our sister institution, UC Irvine. They’ll be switching to the same vendor system we use, and we’ve made a strategic decision to extend our EHR platform to UC Irvine. It’s an outstanding partnership. The five CIOs are collaborating more closely than they ever have before to align and effectively deploy resources. We meet face-to-face on a monthly basis looking for all sorts of opportunities to leverage our scale for increased value. It’s going to be a state-of-the-art medical center, but we’re also deeply committed to the communities in which we have 50-year old facilities and so it’s important that we’re also thinking through how to retrofit until we can rebuild. The CMIO role used to be the sole physician champion in IT, and that’s no longer the case. In many systems the CMIO is now the physician team leader in IT, and so it’s really important that people who are either considering these roles or growing their careers in this direction recognize that in many ways, these roles are less about technology and more about leadership and change management. Gamble: Another thing I wanted to talk about was affiliations and partnerships. UC San Diego Health has a number of partnerships. Can you talk about how that plays into your strategy as CIO? Longhurst: First, let me take a step back and talk about the three key strategic priorities we support from an information services standpoint. The first is supporting facilities growth. We have a brand new tower opening in the fall, Jacobs Medical Center, and we’re deploying some industry-leading and innovative technologies such as patient tablets in every room that will use IP controls to allow for a customized environment — the blinds, the lighting, the thermostat, and the entertainment system can all be controlled through the tablet, as an example. Additionally, patients can see their care team, schedule of medical tests and access MyUCSDChart. This combination of capabilities is not offered elsewhere. The second set of priorities is around network growth, and that includes all of the hospital affiliations that we have with El Centro Regional Medical Center, Tri-City Medical Center, and Eisenhower Medical Center, through the UC San Diego Health Care Network, as well as the development of a clinically integrated network with non-employed affiliate physicians through the UC San Diego Health Physician Network. Some of these affiliate providers are on our electronic health record system, and with others we integrate data from disparate EHRs for population health purposes. We also have a major effort underway with our sister institution, University of California Irvine. They’ll be switching to the same vendor system we use, and we’ve made a strategic decision to extend our electronic health record platform to UC Irvine. It’s an outstanding partnership with Dr. Howard Federoff, the CEO and Vice Chancellor of UC Irvine Health, and my counterpart Chuck Podesta, who is the CIO. Lastly is the ongoing optimization of all of clinical, research, and education information systems to improve the experience for our patients, employees, and medical staff, and so that’s a critical aspect of our strategy. All three of these key strategic priorities need to be supported by an engaged staff and highly reliable and secure infrastructure, so that’s the foundation for everything. To answer your question, within those three priorities, those affiliations mean increased patient access, more coordinated care, and growth. We now have a director of hospital affiliations, Josh Glandorf, who is primarily accountable for working with these affiliated hospitals, and partners with Adam Lyddane, our director of clinical applications, who is also responsible for our physician network affiliation. That’s a model that seems be working well because the amount of work involved is too much for any one person. In addition, I mentioned we have three CMIOs — part of the reason is because it wouldn’t be possible for one single CMIO to do all this work with the extension of our EHR to affiliates. And so our inpatient CMIO, Dr. Clay, also serves as the point person for hospital affiliations, including the work with UC Irvine. Our ambulatory CMIO, Dr. Marlene Millen, serves as the liaison for network affiliation, and our population health CMIO, Dr. Amy Sitapati, is working with those practices that are not on our electronic health record system to develop integrated population health dashboards. Gamble: The initiative to extend the EMR system to UC Irvine certainly seems to make sense for both organizations, and I believe it speaks toward a larger trend we’re seeing in the industry with collaboration. Longhurst: Certainly. One of the reasons I chose to come to UC San Diego was that I wasn’t just joining UC San Diego; I was joining the University of California health system. 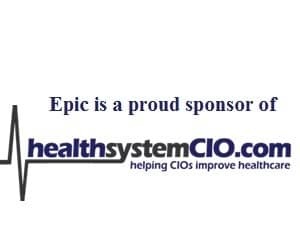 Across the five different UC hospitals — San Diego, Irvine, Los Angeles, Davis and San Francisco — the five CIOs are collaborating more closely than they ever have before to align and effectively deploy resources. We meet face-to-face on a monthly basis looking for all sorts of opportunities to leverage our scale for increased value, so we’re exploring a number of different partnerships across these five UC Health Systems. As far as we know, this is the first example nationally of one academic medical center extending an EHR system to a separate, financially independent academic medical center, and the cost avoidance is tremendous. I credit my counterpart Chuck Podesta with developing this vision, and I believe it is an indication of things to come in the health IT industry as we see further consolidation driven by healthcare reform. Gamble: And as far as the opening of Jacobs Medical Center, that sounds like a great opportunity to be able to implement state-of-the-art technology. Longhurst: It’s absolutely terrific, it’s going to be a state-of-the-art medical center, but we’re also deeply committed to the communities in which we have 50-year old facilities and so it’s important that we’re also thinking through how to retrofit until we can rebuild. As an example, while we’re rolling out tablets to all patient rooms in Jacobs Medical Center, we’ll also be retrofitting the other patient care towers in another part of the city with tablets as well, the difference being that the tablets will have full access to the patient’s medical record, but only in the new tower will they have the room controls built in, since it requires construction integration. Gamble: Lastly, I wanted to talk about the CHIME CMIO Boot Camp, where you spoke about the CIO/CMIO relationship. We know that the CIO role is rapidly evolving, but what about the CMIO role? How do you think it’s changing? Longhurst: I really enjoyed teaching the CMIO boot camp. It’s always exciting to see 30 fresh faces in the room excited about taking on new roles and helping to change healthcare. I think that the biggest takeaway from my perspective is that the CMIO role used to be the sole physician champion in IT, and that’s no longer the case. In many systems the CMIO is now the physician team leader in IT, and so it’s really important that people who are either considering these roles or growing their careers in this direction recognize that in many ways, these roles are less about technology and more about leadership and change management. Gamble: Great. Thanks so much for your time, and I hope to speak with you again in the future.